Most of the stories in the collection seem to speak of the condition of loneliness. Was this intentional when you started off writing the stories? Why the consistent pangs of loneliness running through the book? I’m attracted to writing about loners, characters on the fringe of society. I think their situations make all their emotions, not just ones of loneliness, more enhanced. And while I don’t specifically tackle the issue of loneliness, I think most of the struggle of humanity is to find some connection to the outside world and to find something that fills the open hole inside that we all have as separate human beings. People find all sorts of intriguing ways to fill the hole, and that’s often what fascinates me, whether or not it’s successful on the part of the character. …deep, thoughtful, empathic, sensual, and still learning. …fascinated, curious, searching, looking to get lost for a time. Why short stories to begin with? Was there a specific reason? I didn’t set out to write short stories. I only was exposed to writing them in high school when I took creative writing. And in English, we were introduced to Herman Melville, Flannery O’Connor, and J. D. Salinger. This was the beginning of discovering a form that could do what a novel did in a compressed space. It was more achievable to students, as well. Much easier to complete in a term and to critique in class. After this exposure, I was hooked. Way too many to list. But the ones that had the most impact and have lingered over the years include Flannery O’Connor’s “Good Country People” and “A Good Man Is Hard to Find,” Charlotte Perkins Gilman’s “The Yellow Wallpaper,” Jayne Anne Phillips’s “Country,” Rick Bass’s “The Watch,” and Anthony Doerr’s “The Shell Collector.” But there are hundreds. Your personal favourite story from the collection and why? “The Dark Sun.” It’s one of those stories that seemed almost magically to write itself. I wish more stories came to me as easily as this one did. It was a gift. Do you take a lot of time to structure and write a story? What is the entire process like for you? No, I’m pretty instinctive and just start writing when I have a voice. I let the character take me where she or he wants to go. There are times when I know how the story will end, but still, I write to find my way to that end. Was any story autobiographical/experience first-hand in nature? Does art often imitate life in your works? Many of the stories are based on firsthand experiences at the geographic locations. I’ve traveled to most of the states or countries where the stories are set, and some of the travel experiences–in terms of sites and sounds and smells–come directly from these places. For instance, I did go snorkeling at the Champagne Springs in Dominica, and I did visit a ghost town in Montana. But the stories themselves are complete fiction. Does art imitate life in my stories? I hope so; I think all writers strive for that, not necessarily to imitate their own lives but to capture the lives of others. However, I think it’s for the reader to decide what’s within the stories. After I publish a story, in some ways it’s no longer mine. 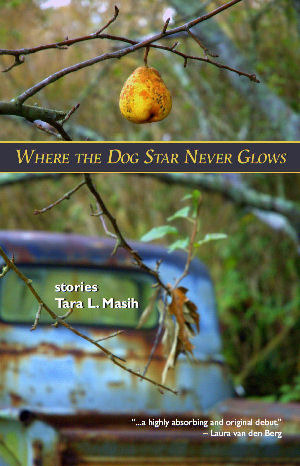 This entry was posted in Books, Interviews, Press 53, short stories and tagged interview, short stories, Tara L Masih, Where the Dog Star Never Glows on April 8, 2011 by thehungryreader.